Russia’s next-generation strategic bomber, dubbed PAK-DA (an acronym for “prospective aviation complex for long-range aviation”), will be delayed past 2023 IHS Jane’s Defense Weekly reports. The reason behind the delay is Russian President Vladimir Putin’s May 2015 decision to revive production of the Tupolev Tu-160M2 long-range supersonic strategic bomber. Basic stats for Russia’s subsonic new bomber are still not totally certain, but an empty weight of around 125 tons with an additional 30 ton payload and range of around 7,500 miles seems to be roughly what the new design is shooting for. 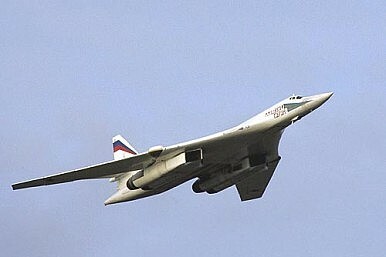 We plan to install NK-32 series 2 [engines] on Tu-160M2. The motor has been upgraded, its main aggregates have become more cost-effective. Therefore, NK-32 series 2 has improved performance, and its range of flight will be increased by at least 1,000 km, compared with existing engines. Borisov also said that the Russian defense industry is in the process of developing new missiles for both the PAK-DA and Tu-160M2. “They drastically change the aircraft’s combat performance. The missiles are to be installed on the PAK DA in the course of time. We are developing new missiles to be integrated on board all types of strategic bombers,” he said. However, according to media reports, Russia’s newly developed hypersonic missile can at the moment only fly for a few seconds. We have an intense plan to reach 80 percent serviceability of all LRA’s aircraft by the end of the year. The solutions to all troubles/issues have been defined in accordance with State Defense Order (GOZ)-2015. The Russian Air Force currently operates 15 Tu-160s, all of which are in the process of being upgraded by 2019, according to TASS. Overall, the Russian Air Force plans to acquire 50 new Tu-160M2s, with three new bombers inducted into the Russian Air Force per year beginning in 2023. The aircraft is expected to be in service for at least 40 years.